Mr. Amay bought a house for Rs. 20 lakhs 10 years ago, and today it costs Rs. 50 lakhs. Isn’t that a whopping sum of money? Appreciation by Rs. 30 lakhs! Well, not if you understand the principle of compounding. If Mr. Amay would have invested the same Rs. 20 lakhs for a period of 10 years, at an interest rate of 9.60% compounded annually, he would have made Rs. 50 lakhs today. 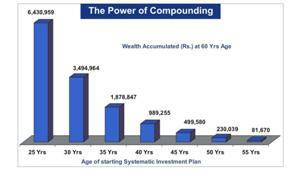 That’s how phenomenal the power of compounding is. Notice, at the end of year 2, your interest is calculated on Rs. 1,100 and not Rs. 1,000. That’s where the brilliance of compounding comes into play. Had the simple interest principle been followed, you would have earned interest on Rs. 1000 and hence interest earned in year 2 would have been lower by Rs. 10 and in year 3 it would be lower by Rs. 21. 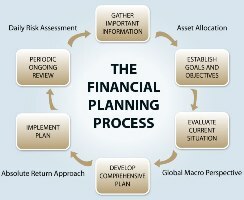 For tax saving purposes and for general investment purpose (retirement planning), many of us invest in fixed interest instruments. Interest on the same is compounded at varied intervals. Compounding is a very powerful tool and in order to obtain maximum benefits out of it, we need to make it work best for us. When does the magic of compounding work best? Both of them retire when they are 58 years. Let’s see the difference in the wealth amassed. Although Tina has invested only Rs. 100,000, she is able to amass Rs. 7.5 lakhs at the age of 58 years because she started investing 10 years earlier than Anitha. On the other hand, in spite of investing a total of Rs. 240,000, Anitha is able to amass only Rs. 6.22 lakhs (Rs. 1.27 lakhs lower). This clearly indicates that, the time for which the investment is done is the key, rather than the sum. Even a small sum of money can make you richer if you are able to invest early. Under the quarterly compounding option, the amount of money amassed is the highest, followed by semi-annual compounding, followed by annual compounding. Albert Einstein rightly termed it the “most powerful force on earth.” Compound interest helps you amass wealth by making your money work hard for you. Make sure you start investing now as it’s never too early to invest. The earlier you start investing, the richer compound interest will make you. Also next time, you look at any fixed interest instrument; make sure your interest is compounded at the maximum available frequency. Make your money work for you.